Due to these benefits, virtualization has become commonplace in large data centers. A 2011 survey of over 500 large enterprise data centers found that 92% use virtualization to some degree.5 Of those, the ratio of virtual servers to physical host server averaged 6.3 to 1 and 39% of all servers were virtual. However, virtualization is less common in small data centers. A 2012 NRDC paper entitled Small Server Rooms, Big Energy Savings6 included an informal survey of 30 small businesses (ranging from 3 to 750 employees) and found that only 37% used virtualization. Nearly $150,000 in direct costs: the costs for VM Ware and SAN were offset by substantial savings in server hardware and networking. Over $130,000 in indirect costs: including substantial savings in the "data center" (power, cooling), server provisioning, and procurement. A 2009 IDC study examined the annual savings at a Landmark Healthcare virtualization effort where 63 physical servers were replaced with 63 virtual servers operating on 3 physical host servers.11 Even with $3,600 in virtualization software costs, the effort saved $60,000 annually due to savings in server hardware, backup system software, and operating system licenses. Note that some utility companies offer rebates that can help offset the costs of virtualization projects. Please review the EPA ENERGY STAR Utility Guide for Designing Incentive Programs Focused on Data Center Efficiency Measures for a list of utilities that offer data center focused rebates. Take inventory. It is easy to lose track of servers as time goes by, as mergers and acquisitions take place, as people procure servers without going through central IT, or as servers are retired or repurposed. The first step toward virtualization is identifying all servers in the organization. Take an inventory of computing resources and their associated application workloads. Identify servers that should not be considered for virtualization. Servers that have privacy, security, or regulatory restrictions, or require ultra-high service levels, tend not to be the best candidates for virtualization or consolidation. What is the purpose of the server? What is the service level requirement? Is there a requirement for this workload to remain on a dedicated physical resource? For example, the exercise may yield a list of 100 "Innovation" workloads that all reside in the same location. You then can determine the resource requirements for the entire group. In this case, you may need 5 to 10 servers to support the resource requirements of those 100 workloads. Examine memory. Virtual host servers tax memory more than CPU utilization. A recent Information Week survey of large data centers indicated that memory is more important than the CPU when evaluating servers in a virtualized environment.14 The survey found that the median memory capacity was 48GB for a server, with nearly one quarter of large data centers buying systems with more than 128 GB of RAM. Estimate processor resources required. Although not the resource that limits virtualization, processor requirements can be estimated by multiplying the reported utilization (% of processor utilized) by the total processor capacity (maximum processor frequency * number of processors * number of cores). This produces a GHz requirement that can be applied to target servers. Keep in mind that application workload can depend on the time of day, week, month or longer if the business cycle dictates. For example, some applications are used primarily during business hours, while others peak during off hours. 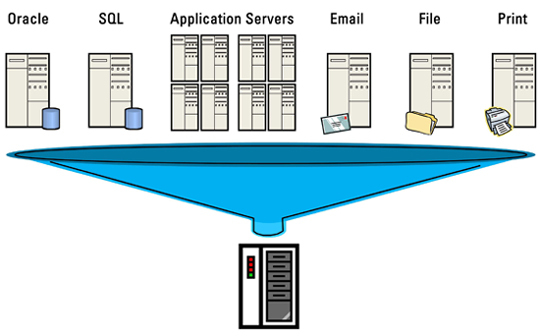 Servers should be sampled at least once per hour over a 30-day period to develop a complete workload profile. This technique ensures that peak- and sustained-load times are captured in addition to normal usage. Combine workloads that have complementary characteristics. For example: Workload A consumes 10% processor capacity during business hours and very little at night. Workload B consumes 10% processor capacity during the night and very little during business hours. Combining the two workloads delivers the best possible results. Keep an eye on cooling. For example, consolidating higher workloads into a smaller footprint is likely to create "hot spots" in your data center. You will need to work with HVAC experts to ensure an adequate and efficient cooling configuration. Track all virtual machines (VMs). Easy to deploy, VMs can get out of control if you are not careful. If new VMs are created for specific projects, be sure they are not forgotten once those projects are completed.